Noted. 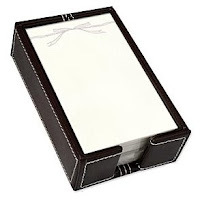 | FineStationery.com: Free Vera Wang Gift with Purchase! Free Vera Wang Gift with Purchase! * Free Vera Wang holder with any Vera Wang or William Arthur order where the applicable merchandise total is greater than $75.00 (this excludes shipping costs.) Only one gift will be given per order. Jotter card design may vary based on availability. This offer may not be combined with any other free gift offer. This offer is valid while supplies last through 11:59 pm EST on Monday, December 15th.